The Needham radio telescope - Polaris sextant, 1956. Launching missiles requires accurate celestial navigation, 24/7, independent of weather conditions. Using radio stars as celestial sources assured all-weather capability. Radio star research was in its infancy. The precise location of the stars was essential to their use for navigation. Developing a reliable "radio sextant" was an equally important requirement. Initially, the Polaris was based on the launch of Jupiter missiles from light cruisers. For this configuration, the radio sextant would be an el/az mounted 28 foot antenna on a gyro-stabilized platform. 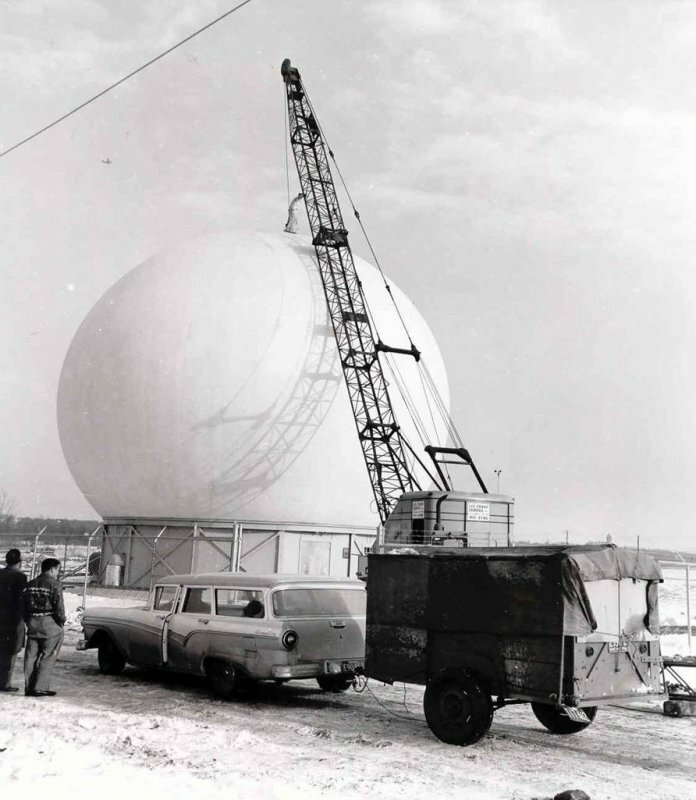 The prototype was assembled in Needham, MA, and was the first use of an air-supported radome. The initial priority was the development of a radio star catalog. That was a classified effort that enjoyed a unique opportunity to compare radio star positions measured at Needham with those measured in England and Australia. The launch of Sputnik caused the transfer of the instrument from the Navy to NASA in 1958. Credit: Photo courtesy of Doc Ewen.